British health workers are being urged to watch out for signs of serious illness associated with E.coli in people returning from Germany. Travellers to Germany have been warned to avoid consuming raw tomatoes, cucumbers and lettuce during their visit as they are believed to be a possible source of infection. Anyone returning to the UK with bloody diarrhoea must also seek urgent medical attention. So far there have been two instances of German citizens in England with symptoms that suggest they may have fallen victim to the bug. Germany is currently gripped by a large outbreak of haemolytic uraemic syndrome (HUS) - a serious complication of verocytotoxin-producing E. coli (VTEC) infection. The strain of VTEC suspected in the outbreak is O104 - a strain rarely seen in Britain. As HUS affects the blood, kidneys and even the central nervous system, and in severe cases victims are required to undergo hospital treatment. This highlights the need for adequate medical travel insurance that covers medical expenses incurred due to injuries and illness while abroad. Nearly 214 cases have been reported in Germany since mid-May. 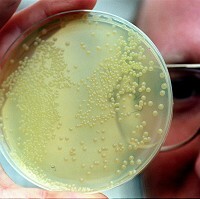 The UK Health Protection Agency (HPA) has said the outbreak is mainly affecting adults - almost 70% of whom are women. Dr Dilys Morgan, head of the gastrointestinal, emerging and zoonotic infections department at the HPA, said: "The HPA is actively monitoring the situation very carefully and liaising with the authorities in Germany, the European Centre for Disease Control (ECDC) and the World Health Organisation (WHO) as to the cause of the outbreak. "We are keeping a close watch for potential cases reported in England and are working with colleagues in the devolved administrations to recommend they do the same."